Mark Carney said the Bank of England is prepared for the worst possible Brexit and that the U.K. faces the steepest economic slump since at least World War II if it crashes out of the European Union without a deal. The stark warning from the governor sees the economy shrinking by 8 percent within a year and property prices plunging almost a third under a worst-case scenario, with Prime Minister Theresa May failing to get her Brexit plan past lawmakers. For context, the peak-to-trough drop in U.K. GDP in the financial crisis was just over 6 percent. In a no-deal scenario, questions about the credibility of the U.K. would send sterling into a tailspin, forcing the central bank forced to hike interest rates sharply to combat inflation. The BOE analysis, carried out in response to a request from a committee of lawmakers, is the latest to highlight the dangers from having no new trade arrangements in place by the time Britain leaves the EU on March 29. While the pound rose about 0.5 percent against the dollar as Carney spoke, that was because Federal Reserve Chairman Jerome Powell simultaneously gave a speech that investors considered dovish. Powell also said the Fed was prepared for a full range of Brexit outcomes. The BOE’s scenarios are likely to draw the ire of Brexit supporters who said the central bank was too gloomy before the 2016 referendum on Brexit. It warned then that there was a risk of recession in the months following a vote for Leave. The economy kept growing. May is pushing her EU Withdrawal Agreement, but it’s not clear she will have the numbers to get it through Parliament in a crunch vote on Dec. 11. If it’s rejected, the U.K. will be on course to crash out into a legal limbo, with no special rules in place to regulate trade with the bloc. Earlier, the Treasury provided its own longer-term analysis, which also includes a hit to growth and incomes under any Brexit option. The BOE made clear that a chaotic departure is not its assumption. It provided other options from what it calls a disruptive Brexit to the economic partnership with the EU sought by May. While a disorderly situation would leave GDP as much as 10.5 percent lower by the end of 2023 relative to remaining in the EU, the loss diminishes to less than 4 percent under an agreement that maintains close ties. 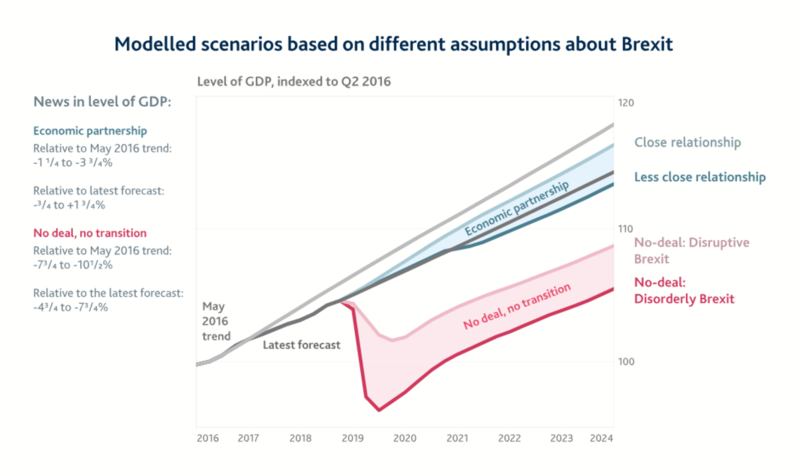 Relative to forecasts made by the BOE this month, Britain would actually be better off in the best-case scenario, but that assumes achieving the closest possible ties with the EU. The immediate hit to the economy from a disruptive Brexit, under which WTO tariffs and other barriers are introduced suddenly, would be about 3 percent, the BOE said. The decline in house prices would be 14 percent. Carney reiterated that the chance of no deal was small, but it’s not impossible. The BOE said the country’s top seven banks are all strong enough to continue lending even during a no-deal Brexit, with all of them clearing the latest stress tests, results of which were released separately on Wednesday. There is never a win on both sides. Brexit supporters and anti-Brexit groups won't see eye to eye. Inflation is a sign of economy downturn so it does not come as a surprise. Brexit brought about historical changes in so many aspects.